We definitely have a soft spot for Hamburger Helper in our house. Cheeseburger Macaroni is probably one of my husbands favorite meals - so much so that if he were ever knowingly given the need for a last meal he might actually consider it. I, too, enjoy Hamburger Helper but considering my love of cooking, desire in expanding my knowledge and wanting to cut out process foods when possible, I try not to rely on boxed meals too much. 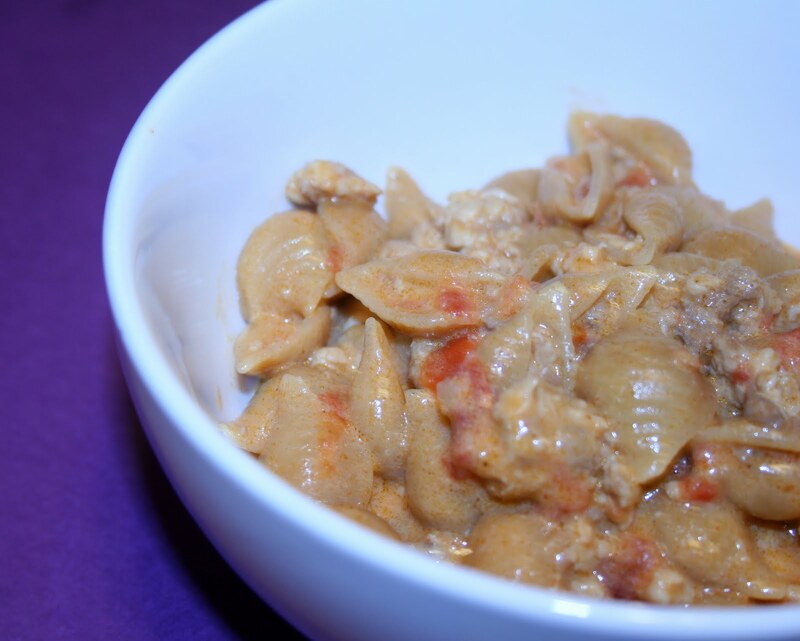 Don't get me wrong - I still love Hamburger Helper and I'm not gonna lie, I'll probably continue to make it every once in a while, but this Creamy Taco Mac will definitely rein supreme when it comes to quick "box" dinners. The concept is reminiscent of classic Hamburger Helper - but I know every single item that was in the skillet. Can't beat that, right? Plus, it was just as quick which is an added bonus. It makes a lot so I did freeze the leftovers - I'm hoping it's just as good defrosted because I'm already craving it! Bring a large pot of salted water to boil and cook pasta per directions. Drain, reserving 1 cup of the pasta water. Over medium heat, brown meat until no longer pink. Drain and add taco seasoning and diced tomatoes. Allow to simmer over low heat for 5 minutes. Add cooked pasta, reserved water, cream cheese and sour cream. Stir until cheese and cream is incorporated and melted. Simmer over low heat about 3 minutes. Season with S & P as desired. Top off with desired amount of cheddar cheese. mmmm love me some creamy taco mac. its so quick & easy and so comforting. makes me think of college :-) glad you liked it!